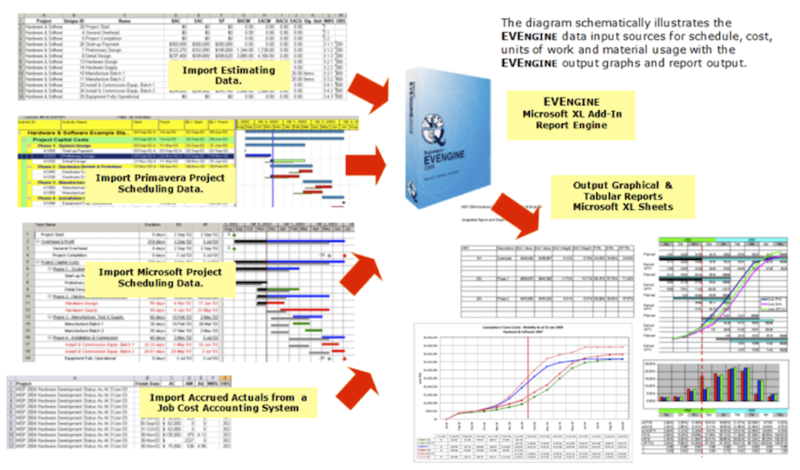 EVEngine is a Microsoft ™ Excel Add-In that delivers commercial Earned Value based project control, performance analysis and reporting to engineering companies, equipment suppliers and contractors operating in the EPC (Engineering, Procurement, and Construction) environment. AACE Earned Value and Cost Engineering Practice Standards. EVEngine features and functionality are designed to cover most computational requirements with respect to project administration, cost control, cost engineering, financial management and modelling. EVEngine is the choice for companies operating in commercial and industrial plant construction, defence, infrastructure, mining, petrochemical and telecommunications industries. Supports Line-of- Business (LOB) project, program, portfolio performance analysis and reporting. It provides integration of traditionally separate accounting and financial control with project management processes. Gives visibility to project performance with respect to cost, work and material / quantity usage as compared to the project’s budget / baseline. It releases project staff from the tedium of data preparation to utilize their time more effectively to undertake performance analysis, problem solving and developing strategies to maintain the project on-time and within budget. Spend 20% on data preparation and 80% on analysis. Generates trends and estimates for cost, work and material / quantity usage to the project’s completion. It is a single source for schedule and financial reporting. No more confused messages about project progress and performance. Earned Value Performance Management (EVPM) prevents the masking of poor performance because of schedule and budget integration. Facilitates performance analysis by single or multiple projects — programs or portfolios to undertake supply chain management. It is designed to bring sophisticated performance measurement to a project or program or portfolio of projects — large or small, complex or simple without the overhead of having to implement and support a complex database system. All data and reports are retained in a Microsoft Excel workbook. Calculates the true cash position for a single project or program or portfolio of projects based on the negotiated contract payment conditions. Case studies show that utilizing EVEngine is 1,000% more efficient in data analysis than conventional spread sheets, providing consistent analysis and reporting across all projects in the enterprise. Supports contract management by calculating certificates of claim and payments for work completed. Using EVEngine for contract administration automates the process and can save 20% of the administrative cost and up to 2% of the total project cost. Supports financial investment modeling and analysis for the project life cycle using discounted cash flow. The functionality is used to rank a project portfolio for investment and financial planning purposes. Supports productivity analysis and compares the project or program or portfolio results against industry published Key Performance Indicators (KPIs). Implementation of EVEngine brings order and consistent reporting to industry accepted standards and guidelines such as PMBOK® Guide. Supports Cost Engineering functionality and reporting to track costs and commodity usage by Stage/Phase, Area/Facility, Control Accounts (CA), WBS, OBS, Resource and User defined fields. EVEngine delivers functionality as used by global Engineering Procurement and Construction Management companies providing EPCM services. Uses Commercial Off-The Shelf Software (COTS) to install to Microsoft™ Excel 2007or 2010 as an Add-In to build on the rich graphing and reporting capabilities. No new investment required in the purchase and maintenance of complex data bases. Utilizes your existing spreadsheet investment and requires ONLY a moderate investment in the software together with training that DELIVERS an advanced and affordable world class project management control system. Case studies show a return a return on your investment in as few as ONE reporting cycle. Provides flexibility with respect to the source of base scheduling, cost, work and commodity usage data. Import direct from a Microsoft® Project 2003, 2007, 2010 MPP file. Import from Primavera®: Versions 6 & 7 or Asta® Power Project using an XER file, Import from any other scheduling software via a Microsoft Excel drop file. Import a project cost estimate organized by a WBS and match to scheduled activity at any outline level. This facilitates the transition from an estimate to a controlled project management baseline. Avoids data duplication and maintenance. Enter and maintain schedule cost, work and commodity usage data direct to the EVEngine spread sheet or use the provided entry wizard. This method maintains the security and confidentiality of the data without having to post it in a schedule. Supports the publishing of graphs and reports toe the web as web parts through SharePoint services. This capability is available to Microsoft Office Excel 2007 or 2010 users. · The following diagram wschematically illustrates the data and report workflow. Optionally hold all cost, work and commodity usage data at within EVEngine, use your planning software to schedule activities only and refresh the EVEngine data sheet with current schedule data. Use the Project Control sheet cost engineering functionality to update spent and forecast remaining units of cost, work and commodity usage. Then run the required EV reports. Substitute planning software posted, control account (CA), actuals (spent) with values collected by the corporate job cost accounting system such as SAP™, PeopleSoft™, Oracle Financials™ using a simple Microsoft Excel drop file. Extend conventional Earned Value to reporting and tracking revenue; then undertake profit and loss analysis and reporting. Undertake financial modeling and investment modeling using discounted cash flow. By combining scheduling data with EVEngine held project capital cost (CAPEX), operational costs (OPEX), cost of production and revenue, determine the return period and internal rate of return taking account of finance costs. Use this data to rank your projects for investment and implementation. Extend cost based conventional Earned Value metrics, indicators and predictors to the performance measurement of units of work and commodity usage. Supports a comprehensive range of Earned Schedule (ES) calculated metrics, indicators and predictors. This technique takes account of the schedule variance and schedule performance index to evaluate cost and schedule performance by time. Supports advanced schedule analysis by historical tracking by WBS, CA, OBS, Resource, Phase/Stage or Area/Facility task groupings, schedule completion, float and baseline schedule variance. Supports Advanced Multi Layered Coding, Filtering and Code Substitution for projects, programs and portfolios. In addition to the traditional Earned Value WBS, CA and OBS code structures, Resource, Stage/Phase, Area/Facility and two User defined Text Fields are supported. This combination of fields allows for large multi-disciplined engineering and construction projects to be effectively controlled. Supports a comprehensive set of project Cash Position reports and graphs that models by Project and Control Account (CA) the real cash position based on the payments conditions negotiated with the suppliers of goods and services. This feature facilitates life cycle financing and revenue projections. Generates and supports Contract Performance Reports, CPR/Format 1, 2, 3, 4 and 5, to US Government Agency and DoD requirements to track and report by Work Breakdown Structure (WBS) and by Control Account (CA). Supports Automated Contract Administration to generate Earned Value based Certificates of Payment and Claims together with their continuation and payment summary sheets. This feature utilizes the Earned Value Percent Complete to calculate the period payments by project and or by Control Accounts, representing contractor, supplier work packages. This feature tracks each payment including retentions and adjustments that are progressively made to the control account. This feature saves significant time and effort savings can be made by using EVPM based claims reconciliation.. This functionality is designed to significantly improve the efficiency of the project’s contract payments administration process. Ships with extensive documentation covering: Installation and activation, Guidance on data organization, functionality and operational aspects, Principles and practice of Earned Value Performance Management (EVPM), with graphs and report interpretation. Licensing works by subscription to a plan for a period of one year, two years etc. To continue, just renew the subscription. A number of companies use this plan as a subscription is usually fully tax deductible. Each customer is entitled to three one hour on line training sessions. This covers EVEngine basic features and is delivered in English using GoTo Meeting. The customer requires 3G quality connectivity for best results. Supertech delivers, additional on line training covering specific subjects such as Certificates of Claim and Payment, Contract Setup and Administration, Government Agency Reporting, Cost Engineering, Project Controls for a Mega Projects etc. Charges are provided on application. Supertech can provide in specific geographic areas certified EVEngine consultants, who in addition to any in-house training, can assist in setting up the project control system to maximize the benefits EVEngine features brings.